I remember from my Air Force days that the recce community had the motto "unarmed and unafraid". When our crews started working with that community, we learned the full motto was "Whoever coined the phrase 'unarmed and unafraid' was full of s$$t". It was gratifying the see the RF-4Cs from Bergstrom heading to Desert Storm armed with AIM-9 Sidewiders (finally!). The RF-4 was developed by McDonnell Douglas to carry the latest in cameras and sensors to replace older platforms like the RF-8 and RF-101. The Marines operated the RF-4B while the USAF operated the RF-4C. An export version was later released which was essentially an RF-4C with the later J79 engines used with the F-4E. For those of us who've been modeling a while, you'll remember the variety of Italeri kits released in Testors boxes. Some of those kits remain the best of kits of their subjects in a given scale to date including the 1/72 and 1/48 C-130E/H, AC-130A, DC-130; the 1/48 SR-71 and YF-12; the 1/72 C-119 and AC-119; 1/72 B-57G; and many more. It is hard to believe after all these decades, nobody has attempted to update/replace these kits. One of those kits also in that series was the 1/48 RF-4 Phantom II. It was released as an RF-4B, RF-4C, and RF-4E and for many years was the only option for a recce Phantom. Eventually someone developed a (heavy) resin nose conversion for an F-4B or F-4C kit, and that was followed by Hasegawa developing new tooling to render their family of 1/48 recce Phantoms. Hasegawa has recently reissued their RF-4E kit. I noted that Italeri was releasing this RF-4E kit with new tooling, so I thought it might be worthwhile to see what is new. 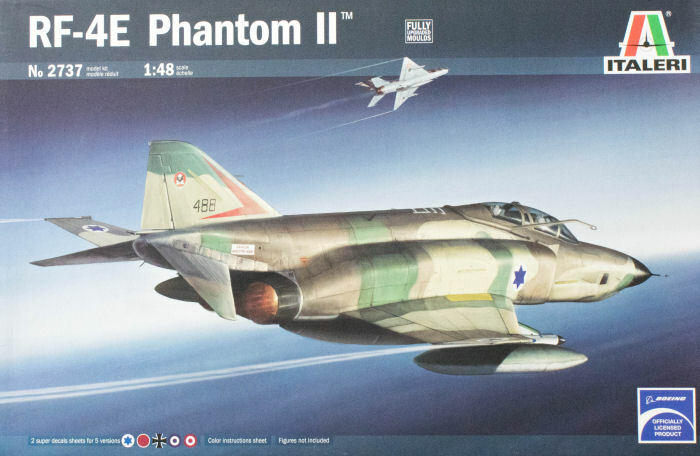 The box art is interesting as it shows a MiG-21 zipping past while the RF-4E is depicted with near-full nose-up pitch in the stabilators but the contrails show it driving straight and level. As before, the kit is molded in light gray styrene and presented on three parts trees plus one tree of clear parts. This kit is simple in construction, but it can provide some fit and finish challenges that will require patience and filler. The kit provides standard F-4 external fuel tanks for the outboard stations and the centerline. The inboard stations carry the chaff/flare launchers and while the kit shows this aircraft carrying four AIM-9s, please check your references as I've only seen the really late service RF-4Cs ever carry heaters. If you must have AIM-9s on your model, please replace these as they are not good representations of the AIM-9J. The kit also provides four AIM-7s but these are not used in this release (two of the parts trees are shared with the Italeri 1/48 F-4J). The cockpit is rather sparse and the kit's ejection seats would be best replaced with aftermarket seats. Ditto on the exhaust nozzles. Another new item in the box is the ALQ-119 short pod which you will carry under one of the inboard stations. The decals are provided on two large sheets plus a small addition with better instrument panels rendered. The first sheet provides the distinctive markings for each of the five subject options while the second sheet covers an array of airframe stencils. Suggested retail price of this RF-4E is a little more than $20 USD lower than the Hasegawa RF-4E which was also recently reissued. Both will benefit from aftermarket upgrades, the question is simply where you wish to start.